The atomic force microscope (AFM) is a very powerful microscope invented by Binnig, Quate and Gerber in 1986. Besides imaging it is also one of the foremost tools for the manipulation of matter at the nanoscale. The AFM consists of a cantilever with a sharp tip at its end. The tip is brought into close proximity of a sample surface. The force between the tip and the sample leads to a deflection of the cantilever according to Hooke's law. Typically, the deflection is measured using a laser spot reflected from the top of the cantilever. If the tip were scanned at constant height, there would be a risk that the tip would collide with the surface, causing damage. Hence, in most cases a feedback mechanism is employed to adjust the tip-to-sample distance to keep the force between the tip and the sample constant. This can be achieved by mounting the sample on a piezoelectric crystal. 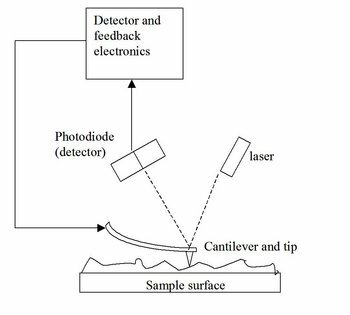 The tip is then scanned across the sample surface and the vertical displacement s necessary to maintain a constant force on the tip is recorded. The resulting map of s(x,y) represents the topography of the sample. Over the years several modes of operation have been developed for the AFM. The primary modes of operation are contact mode and dynamic mode. In the contact mode operation, the force between the tip and the surface is kept constant during scanning by maintaining a constant deflection. In the dynamic mode, the cantilever is externally oscillated close to its resonance frequency. The oscillation gets modified by the tip-sample interaction forces; these changes in oscillation with respect to the external reference oscillation provide information about the sample's characteristics. The dynamic mode generates lower lateral forces on the sample and is widely used to image biological samples. Schemes for dynamic mode operation include frequency modulation and the more common amplitude modulation. In frequency modulation, changes in the frequency of modulation provide information about a sample's characteristics. In amplitude modulation (better known as intermittent contact or tapping mode), changes in the oscillation amplitude yield topographic information about the sample. Additionally, changes in the phase of oscillation under tapping mode can be used to discriminate between different types of materials on the surface. The AFM has several advantages over the electron microscope. Unlike the electron microscope which provides a two-dimensional projection or a two-dimensional image of a sample, the AFM provides a true three-dimensional surface profile. Additionally, samples viewed by an AFM do not require any special treatment that would actually destroy the sample and prevent its reuse. While an electron microscope needs an expensive vacuum environment for proper operation, the AFM can work perfectly well in an ambient or even liquid environment. The main disadvantage that the AFM has compared to the electron microscope is the image size. The electron microscope can show an area on the order of millimetres by millimetres and a depth of field on the order of millimetres. The AFM can only show a maximum height on the order of micrometres and a maximum area of around 100 by 100 micrometres.